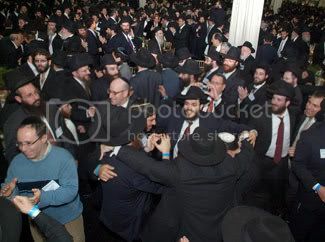 Chabad-Lubavitch emissaries and lay leaders dance at an international conference of Chabad emissaries. SOMERSET, N.J. (JTA) – The life of a Chabad-Lubavitch shaliach can be isolating. Sent under the mandate of the late leader of the movement, Rabbi Menachem Mendel Schneerson, to the ends of the Jewish world, these fervently Orthodox emissaries are often the only affiliated Jews for hundreds of miles. When they sign on to spend the rest of their lives trying to start Jewish communities in remote places, they often put themselves in areas where they are the only Jews that observe the laws of kashrut and Shabbat. Still, since 1950, when the rebbe sent out his first emissary to Morocco to build up Jewish education in North Africa, some 4,000 have dispersed around the world, from Beijing to Ukraine to Laos to Boise, Idaho, and virtually every spot in between, where Jews might live or pass through. This past week, from Nov. 15 to Nov. 20, some 2,800 emissaries converged on Chabad-Lubavitch International headquarters at 770 Eastern Parkway in the Crown Heights neighborhood of Brooklyn for the movement’s annual International Conference of Chabad-Lubavitch Emissaries. The annual “kinus,” as it is known in Yiddish, offers a wide range of workshops, from staffing issues to meeting the needs of the Sephardi community to prison chaplaincy. The conference banquet is seen as the highlight, and this year it drew some 4,000 people, filling 396 tables at the Garden State Exhibition Center in Somerset, N.J., on Sunday night. This year’s banquet honored Chabad’s largest benefactor, Sami Rohr. Rohr, a former Colombian Jewish real estate mogul who affiliates as modern Orthodox, and his family have given tens of millions of dollars to Chabad to establish outposts throughout the former Soviet Union, on college campuses and at remote spots around the world. Reportedly, they underwrite the salaries of some 500 emissaries, and have a foundation specifically to help Chabad rabbis on U.S. campuses construct buildings. Though Rohr, his son George and their family have been involved with Chabad since the 1950s, this was the first time he was honored by the organization because he tends to shun publicity. And though the thousands of men dressed in black and white hung on their benefactor’s words, it was Rohr who lauded Schneerson’s army of shluchim, expressing pride that Odessa, Ukraine, recently had two Torahs underwritten by families that found their Judaism through Chabad, and that in Athens, where the Jews defeated the Greeks in the Chanukah story, Chabad had erected a giant menorah. “There are those who speak of Jewish continuity, but you are the ones who create it,” Rohr said, a banner bearing the rebbe’s likeness hanging off to his right. After Rohr’s speech, the conference chairman, Rabbi Moshe Kotlarsky, called off each country and state where Chabad has placed shluchim — among them one in Vietnam, seven in China, four in Kazakhstan, 118 in Russia, one in the Virgin Islands and 23 in Texas. But as impressive as was the list, it paled next to the sight of 4,000 Chabad emissaries and supporters breaking into a spontaneous dance that snaked wildly between the 18 rows of tables 22 rows deep. But for the shluchim, the kinus is more about the “farbrengen” — Yiddish for a spending of time together — than it is about the workshops and the gala. It is there where the thousands of men dedicated to the teachings of the rebbe, most of whom knew each other as yeshiva students, can reconvene and spend a little time not on an island, but in a Chabad sea. “There’s nothing like the energy here, the synergy here,” said Mendel Lifshitz, who runs the Chabad in Boise. It allows rabbis such as Hershey Novack to share with his colleagues ideas such as the Kosher Cooking Club that he has started at Washington University in St. Louis, where bi-weekly he organizes a coed class in cooking Jewish ethnic foods from challah to kubeh. And it gives the emissaries a chance to share success stories. For instance, Rabbi Yosef Chaim Kantor, who started Chabad in Thailand, which now sees some 110,000 visitors a year through four centers there and one in Laos, can tell the story of the one Israeli tourist who actually became a Chabad rabbi after a chance encounter. But, many say, it provides them with a confirmation of the reason they have committed to spending the rest of their lives in foreign lands. Though they are pushed by the success stories and by the potential and need for more, there are challenges for these stridently religious families who isolate themselves in areas where there are few observant Jews. When Kantor got to Thailand, finding anything kosher to eat was a challenge, as was anything cultural. “There was no one that understood me,” he said. For some it is even harder. “Menachem” for instance can’t even be known. He asked that his name not be used, nor the country where he is stationed identified because international religious organizations are illegal there. In his adopted country, Menachem typically wears a baseball hat and cotton pants in public, instead of the typical black suit and fedora that is Chabad uniform. Kosher food, too, is impossible to find. So he and his wife slaughter their own chickens, milks cows and make their own yogurt for themselves and the hundreds of Shabbat guests they host. “It is difficult for my wife and kids to find friends,” he said. But for the week or so he will spend in New York for the conference, he and his family are free to be more openly themselves. He wears his black suit in public, and allows his children to eat nearly all the kosher junk food they can handle. And of course he will return to his country with seven extra suitcases of food.